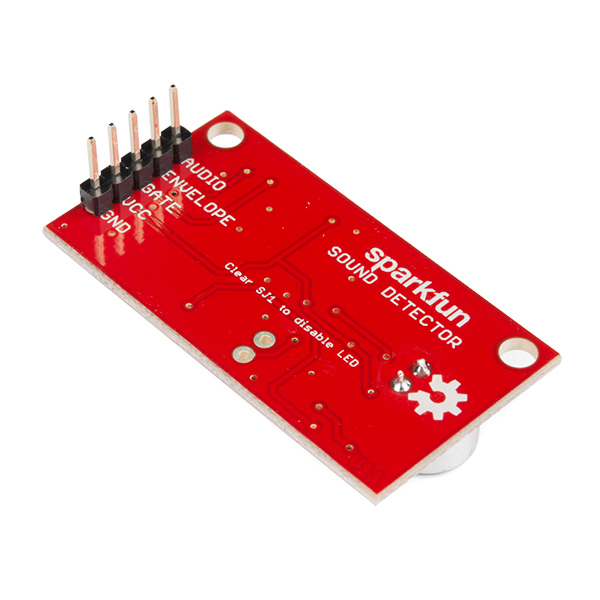 The SparkFun Sound Detector is a small and very easy-to-use audio sensing board with three different outputs. 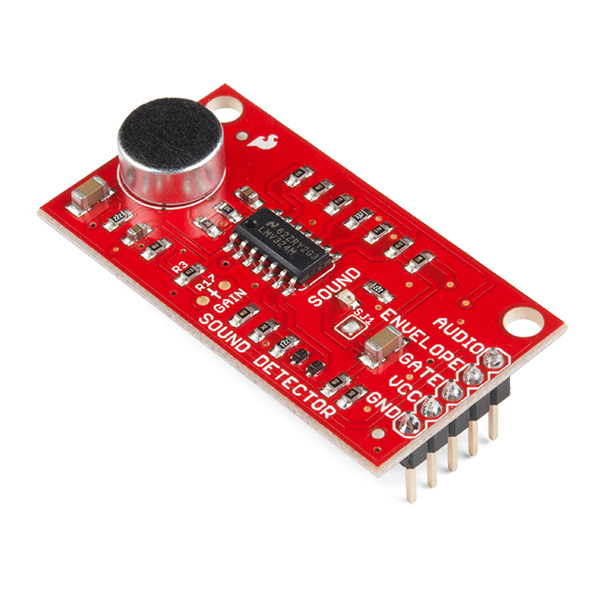 The Sound Detector not only provides an audio output, but also a binary indication of the presence of sound and an analog representation of its amplitude. The three outputs are simultaneous and independent, so you can use as many or as few as you want at once. 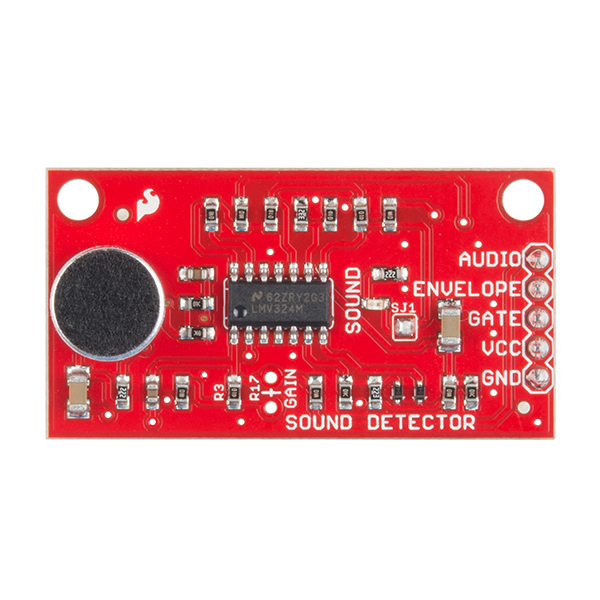 The envelope output allows you to easily read amplitude of sound by simply measuring the analog voltage. Gain can be adjusted with a through-hole resistor to change the threshold of the binary (gate) output pin as well. Check the hookup guide below for more information about setting gain. Each of the three output signals is present on the pre-soldered 0.1" header at the edge of the board. They are active simultaneously. If you aren’t using one in your particular application, simply leave that pin disconnected. this project shows how to switch on a led strip with a clap. Listen to your sleep quality. 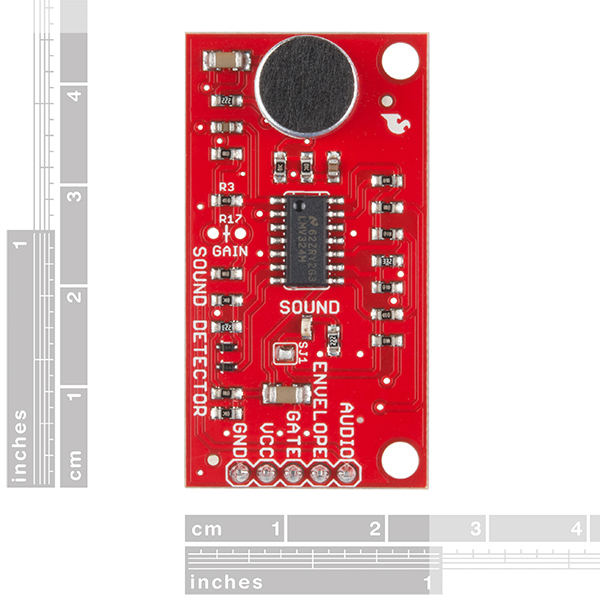 You can hear what your sleep sound by monitoring key parameters using 2 micro:bit processors. Hi, Can this be used to capture low decibel sounds ( sound that is not audible to human ears) like internal organs sound? This was very easy to use. I wanted to monitor the volume of sound coming from my furnace and send IR signals to my TV speakers. The envelope setting was a very easy way to get the volume level of sound. I also looked at the audio and gate options which were equally as easy to use. I had first tried to use a MEMS microphone breakout and had some difficultly because the voltage range was very low between high and low volume. That microphone would also drift in readings so I had to make rolling adjustments. I did learn a lot from struggling with that microphone. I think if you are getting started and not familiar or ready for making amplifiers or making adjustments to readings, this is a very nice option. This guy is just what I needed. It found it a little too sensitive, which I consider better than not sensitive enough.